Inspiration for meals sometimes comes when I'm browsing for ways to use an individual ingredient, and this time I was actually looking for something to so with the ground turkey in my freezer. On further consideration, I decided to try this in a vegetarian soup to be able to share with my husband. So the inspiration ingredient doesn't even show it's face in this soup! Minestra was not a name I was familiar with until looking through a Trader Joe's cookbook. Minestrone, yes, but not minestra. It fits though! Minestra Polpetta literally means Italian meatball soup. Tip: If celery, zucchini, and cabbage aren't your style, substitute in leeks or fennel. Or add a combination of all 5! Just adjust the veggie quantities so the amount of broth still gives you a good soup consistency. Heat soup pan and add oil over medium heat. Add the celery, garlic, and poultry seasoning, pepper flakes, and sauté, stirring regularly until celery is tender. The zucchini and cabbage can go in next, cooking for several minutes. Add the chicken broth and water and return the pan back to a low simmer. Gently pour in the tomato sauce to prevent splattering. Give everything a good stir and place the meatballs in the center of the pan. From this point out, be careful not to displace the meatballs too much when stirring, or they will fall apart. Simmer for 10-15 minutes until the liquid reduces slightly, all the veggies are tender, and the meatballs are fully warmed. 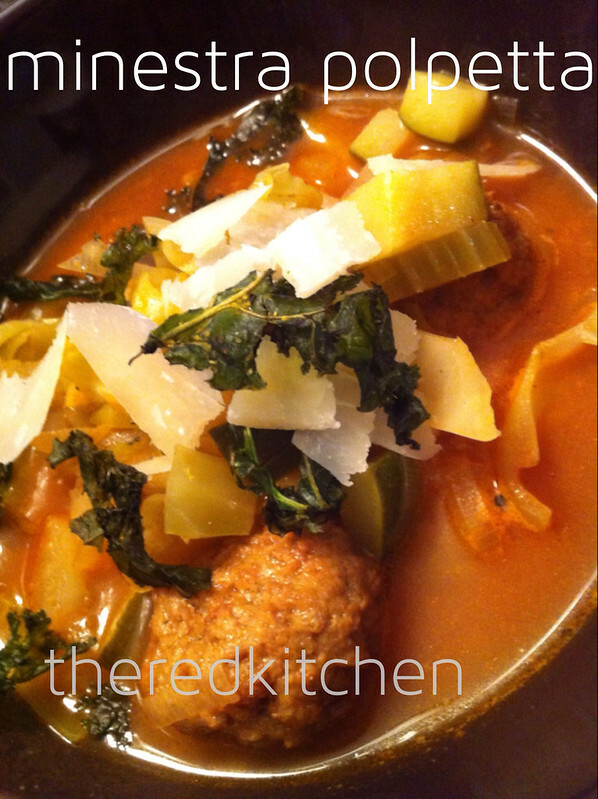 Scoop into soup bowls, add a curl of parmesan, and a few kale chips. Enjoy!